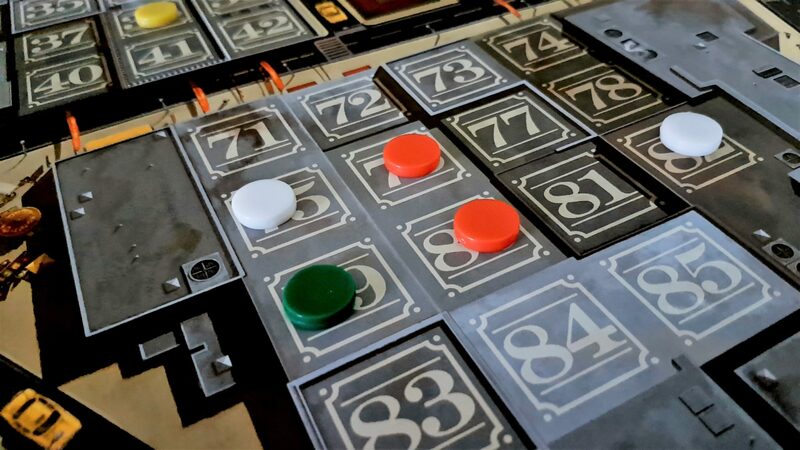 This is the review I never thought I’d write – a review of a game that gets the full five star rating on Meeple Like Us. I’ve said many times on the blog that Scrabble is the only ‘unofficial’ holder of that grade ranking as it does – even now – as my favourite game of all time. I thought its position was pretty much secure forever. I believed there was nothing that could seriously challenge it. And then along came Chinatown and it instantly wormed its way into my heart like a parasitic tick. It jostled Scrabble from its seemingly unassailable position on the pedestal of my affection. ‘Budge up, make room’, it said as it settled in. And now here we are. I almost didn’t review this game because it is aggressively out of print but I hear tell that a new edition is in the works and as such I want you to be ready to snap it up whenever you see it. In many respects, stars and rating are really a completely pointless distinction. Review scores in general are rarely truly meaningful by themselves. People look at them from all kinds of different perspectives and assign value, or not, at arbitrary thresholds. For this site I basically map the word I’d use to describe the game to a star value. Good is three and a half stars. Great is four. Four and a half is excellent. Five? I don’t even know. Even with this, it’s hard to expect my own personal assignment of semantic meaning would survive its flattening into a simple star value. I think a good game is three and a half stars but plenty of people would take umbrage at their favourite receiving that in a review. So, what do I even mean here? Five stars doesn’t mean a game is perfect, because that’s not true of either Chinatown or Scrabble. Both have expectations of their players that result in a lot of weird mental book-keeping that forces you to spend more time outside the game than you do inside. Scrabble requires enough lexical dexterity that you’d be forgiven for thinking it’s some kind of word game. Chinatown has equally demanding expectations. These though are in terms of a fluid and complex numeracy that’s bound up in the context of diplomacy, negotiation and simple exhortation with menaces. A five out of five score doesn’t even meaningfully relate to anything as subjective as ‘fun’. I’ve played the living hell out of Scrabble but I’d be hard pressed to call many of those encounters fun. The best of them left me feeling wrung out and bone-weary. A lot of the time in Chinatown you’re tense because the heart and soul of the game is to be found in the thrust and parry of offer, counter-offer and economic ambush. Chinatown is naked Capitalism shorn of all its pretenses, and Capitalism is only fun if you’re winning. So, yeah – let’s not dwell on the fact that Chinatown gets the perfect score on this blog because perfection is an illusion and all things eventually turn to dust. Life is an endless spiral into our own eventual oblivion. The only truly lasting judgement is the grave. Let’s just talk about why it’s absolutely the best game we’ve covered on Meeple Like Us. As I get older I become increasingly critical of complicated rule-sets. When I pick up a manual that is thirty pages long and full of dense legalese I’m not likely to say ‘This looks deep and complex’. I’m probably going to say ‘This looks a bit amateurish’. 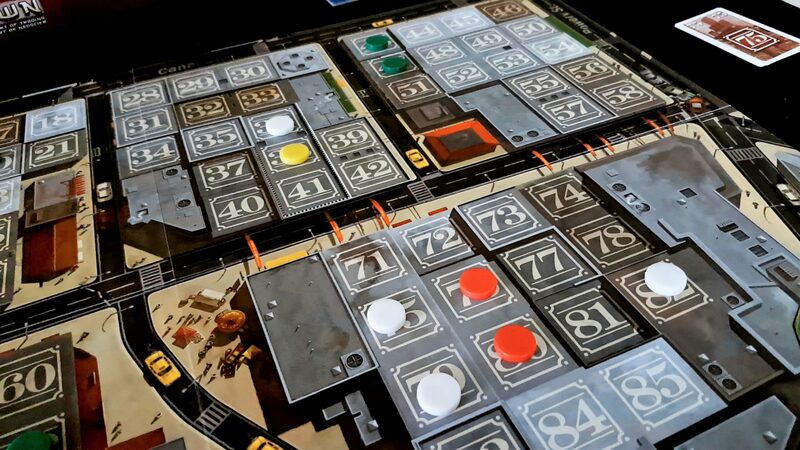 The fewer rules a designer needs to find the fun, the closer you get to the Platonic ideal of what tabletop games should be. The job of the rules, I have come to believe, is to get out of the way of you enjoying your friends. The ideal game should open itself up and envelope you in its possibilities. You shouldn’t be wrestling with the systems, you should be wrestling with the people around the board. Here’s all you need to know about Chinatown. The game is played over six rounds. You get a small pile of cash that represents your initial spending capital. Your job is to have the most money at the end. 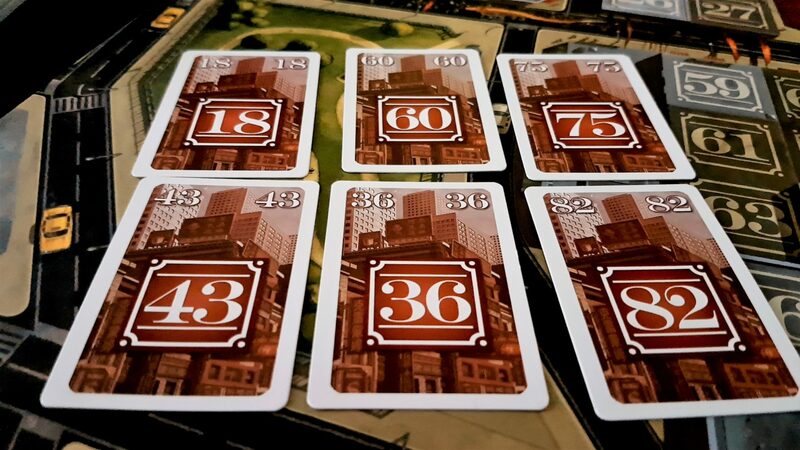 Each round, each player gets dealt out a number of random shop tiles. Each has a maximum size, and you get money for each placed lot. You get more money for contiguous arrangements of the same business, and they become disproportionately lucrative when you’ve placed a complete business. At the end of the round, you place whatever shop tiles you want to commit and collect your income. 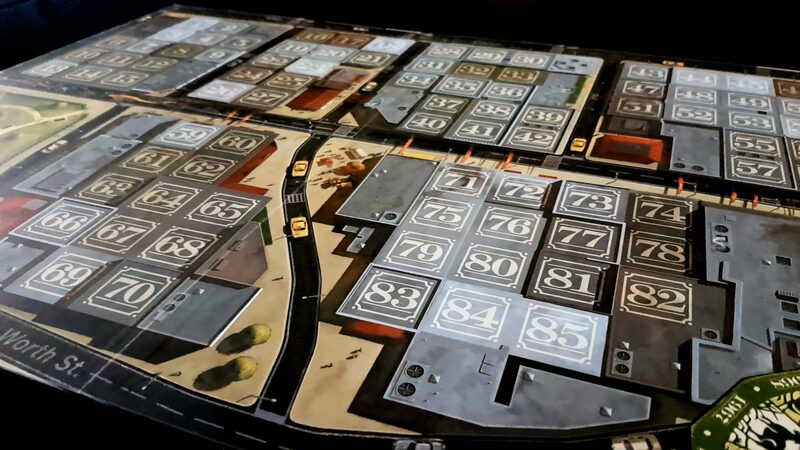 Those of you that have been reading this blog for a while may remember when we tackled Lords of Vegas and said ‘this is the reason why nobody should play Monopoly ever again’. 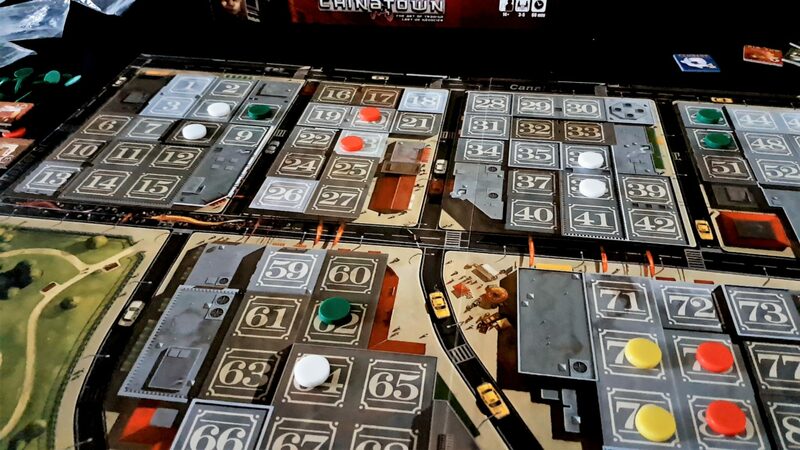 Chinatown is the reason that nobody should play Lords of Vegas any more. It shares a lot of structural similarities, although as the older game it can make a very convincing ‘prior art’ claim. 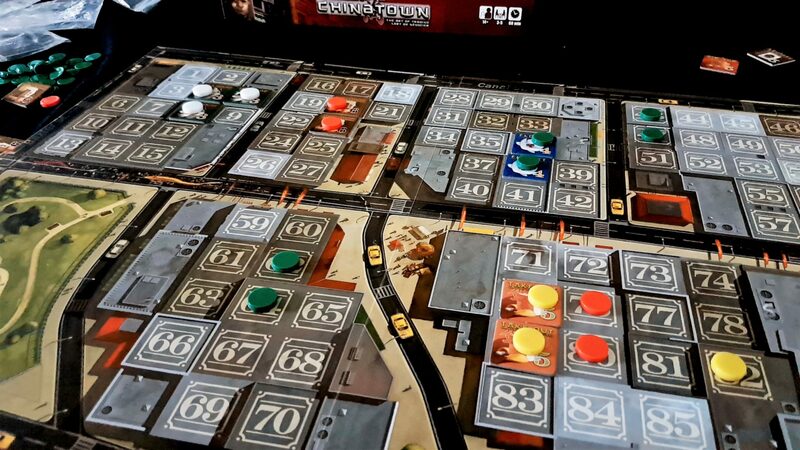 Chinatown is less complicated, gives you fewer options, and has a much less innovative scoring system. It’s borderline austere. And it’s in this austerity that it accomplishes its greatest goal. It gets the hell out of the way of you having fun. 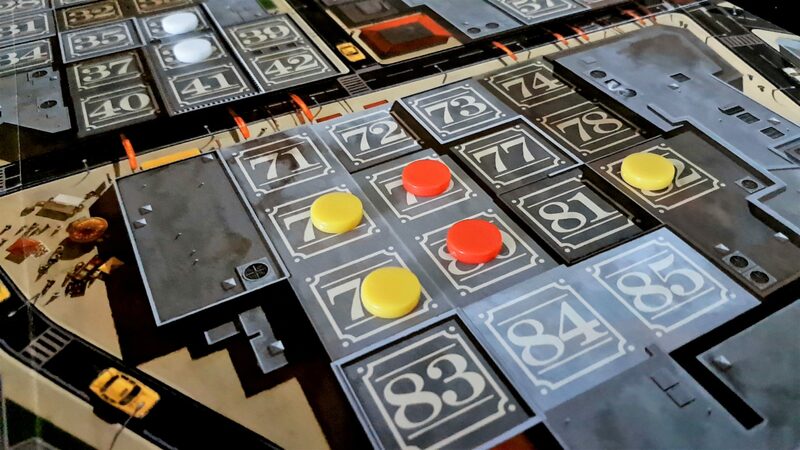 Every game of Chinatown is exactly the same – it doesn’t have special asymmetrical tiles you swap in and out. The board isn’t modular. There are no special player powers. Every single game will be all but identical… right up until the point that ‘some business happens’. And right there – this is a game that expands and explodes like a god-damn supernova because there are no rules that cover business. Do you want to trade money for a lot? Go ahead. Do you want to trade lots for a shop? Absolutely, fill your boots. Do you want to exchange two lots and a shop for a chunk of money and a promise of future remuneration to come? Well – risky but you do you. You do you. As the manual says only the laws of the market prevail. Trades are done simultaneously, at cross purposes, and often with people actively trying to undermine each other. Deals come within a handshake of being made before one party gets cold feet and someone else swoops in. Players conspire openly with each other in front of their victim only for their victim to cut their legs away by making a deal with an otherwise uninvolved fourth party. Do you want to trade sexual favours against a night on the sofa? It’s not specifically prohibited so you can do what you want! Once I tried to buy a tile I didn’t need just so I could very obviously use it to strong-arm another player’s wife into a punitive deal that would have left her penniless for turns. ‘Look, this is the only chance you’ve got to buy this lot you need’, I said, ‘But you can always get another wife’. Let’s look at an example so you can see just how deep this goes and how quickly you go from being a novice to a master manipulator. There’s almost no acceleration between ‘Oh, I think I understand this’ to ‘I will actually cut you if you make this deal’. Consider the board state below. The important thing to remember here is that contiguity is king – there are exponential effects that come into play when you place bigger businesses. A single placed tile earns you $10k a turn. Two gets you $20k. Three, $40k and so on. If you complete a business, you get even more still. Big businesses are very lucrative but equally hard to place. Small businesses can have a quick turnaround if you can find a way to structure a deal that gets you all you need at the right time. Let’s role-play how that works in practice, using the board arrangement outlined above. Here it doesn’t really matter what people have and where – what matters is where they share mutual interests. Green decides that they can make a trade with white – a straight up swap where they trade off lots so they both get two lots together. Green has lots in a distant district they can use for that. Green abandons any leverage on red, and thus cedes the fight to white. After all, a battle is just going to keep both warriors distracted and if you can direct that future aggression to someone else why wouldn’t you? From there we have two obvious potential deals that emerge as a result of he first. White can trade something to red for the two red lots, or red can trade something to white for the two white lots. The position is slightly stronger for white because they have another lot in that section and maybe the random lot drawing will bridge the gap. A fair offer would be two lots for two lots, with red perhaps incentivising with some money or an additional shop tile. But life isn’t fair, and everyone knows it. See, each lot has a diminishing return because there are a fixed number of rounds. If you place a complete small business in the first turn it will be worth more, in the long term, than the complete large business you place in the last. You want to make deals quickly so you start your engine running – more businesses mean more money, means more leverage, means more opportunities, means more businesses. And everyone at the table knows that too – maybe not in the first round of their first game but trust me – the learning curve here is incredibly shallow because fundamentally we all know about people. Red might want to hold on to those tiles just because the best time to close a deal is when the other person is desperate. It’s not going to do anyone else any good for white to emerge with a dominant position right out of the gate. So what does white do? Maybe they trade everything they have in that area to yellow. Well, crikey – basically with this all white has done is say ‘Yeah, I think there’s a real deal to be made there but it’s one I don’t want to make now and I don’t want the risk of not being able to make it later. Anyone else a gambler?’. Green already threw in the towel in the same way, but white made that initial deal in the hope that yellow would be willing to leap in. Yellow had the better resources for trading with red, and yellow also had less contentious lots elsewhere on the board that were better for white. That deal probably wouldn’t have been possible had green not essentially given white the option as a result of proffered adjacency. ‘Sure’, says Yellow, and takes on that set of properties in exchange for offering up others of their own – specifically the ones white had been keen on getting from the start. That whole section of the board is a warzone and essentially what white is hoping to sell is the pickings from the graveyard that will emerge. It’s even an easy sell since the early negotiations between red and white, and between red and green earlier, will have mapped out a lot of the willingness of everyone to do a business. But why would you bother doing this at all? Well, it’s because these lots are not businesses yet. They’re expansion opportunities and since everyone is going to be getting new lots every turn you need to be playing with an eye to the future. Often a deal isn’t made just because someone decides ‘You know, I think my odds are good I won’t actually need you next time’. A handful of trades can put people into positions where they feel more confident that fate will smile on them. They rely on the fact that early on nobody has too much skin in the game. That jockeying for position is what pulls everyone in. Each new trade gets people more invested in the shared board state. Once a few of these swaps are made, people are starting to carve out influence and routes to power. They’re starting to plot and plan. This is where the calculations start to come in as everyone computes their way through the financials of each proposed arrangement. Chinatown starts getting interesting here because the simple trades are just that – simple. Compound trades involving multiple different commodities and asymmetrical advantage are much harder to work out. It leads to rabbit holes of arithmetic just to understand what’s even on offer. A lot of the deals you make in Chinatown are visceral. You can calculate it all out, and you’re going to have to. But there’s only so far that goes because of the window of uncertainty through which you’re hurtling. When the scoring is compressed down into ‘who has the most money’ it’s not just about what you get. It’s about what everyone gets from you. You spend a lot of time circling the drain of your own uncertainty in the face of the roiling oceans of negotiation. Once all the business has been conducted, the shop tiles to which people are willing to commit are placed. Even this can be an act of intimidation. Permanence by itself can have a distorting effect on the microeconomies that are represented by each individual intersection of lot, shop and player within a district. Someone placing down tiles in a contested area is an aggressive move. It’s a declaration that the rules have just changed. Once everyone is done, everyone collects their money and the next set of lots and shops are dealt out. This, inevitably, is where the gloves start coming off because people have their own selfish interests at heart now. The board is no longer simply what they were all dealt. The board is what they all built. The board is the result of blood, sweat, money and occasionally real tears. Once people have developed their little empires, every encroachment has to be interpreted as a threat. But when two people are butting up against your territory – well, that’s a momentum you can turn in on itself. The enemy of my enemy isn’t necessarily my friend, but occasionally you can negotiate for their temporary affection. The wheeling and dealing I’ve outlined here is only a pale facsimile of what it’s really like in a game of Chinatown. There are usually at least two deals being worked on in parallel, and often those deals will depend on the deals other people make. The people involved in active negotiation can turn on a dime. Whether consciously or just accidentally people will end up making three or four-way trades that are as lucrative as they are fragile. Trading in games like Catan is fundamentally boring because there’s a fixed value and a fixed exchange to which everything is pegged. In Chinatown every single deal has a calculable financial return and an incalculable impact on your future possibilities. That’s why you can math out every last inch of a deal only to find out that it doesn’t work out to give you anything close to what you expected. The rolling, boiling social context is electric. It’s infectious. You feel empowered when making deals even if they are intensely to your detriment. There’s a sense of strength and virility that comes from behaving decisively in an indecisive world. Chinatown achieves all of this not with expansive design, but with a genius frugality of design. It’s perfectly engineered to be just enough without pushing beyond it. 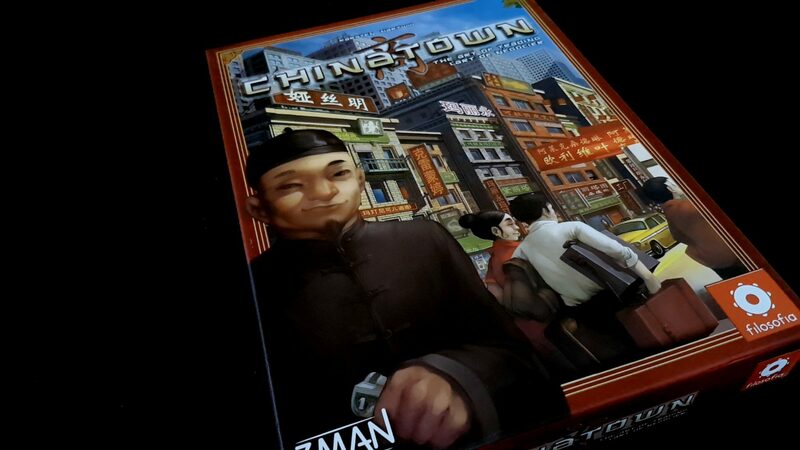 Chinatown is built around what may as well be a spiritual epiphany – all a game need do is give people just enough to fight about and let them set their own rules of engagement. The game doesn’t need to push anyone if people can be trusted to push each other. The result is that the game always rises to the Machiavellian instincts of the savviest operator, but gains an unpredictability and equity from those that are most easily manipulated. A deal is only solid as long as all the fundamentals are true. Seeing someone trade away the one thing you needed to bring it all together is like seeing your car-key drop down a drain – it carries all your hopes of a good day with it. What soon follows is the dense awareness of the opportunity costs you squandered in attempting a heroic piece of economic chicanery. 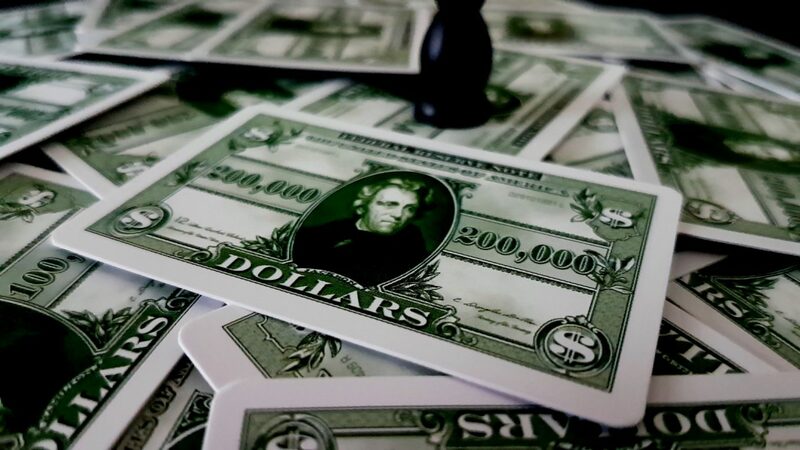 And then when it becomes obvious that one player has gained sufficient accumulated advantage to dominate the game, well… at that point all the social rubber-banding comes in to play as the collaborative dynamics work to cut them out of further deals. As I said earlier though – it’s not flawless. All that arithmetic and puzzling out of the financials is overbearing and it occasionally acts like a sedative pumped into the tension just as it gets most exciting. It’s less Gordon Gecko and more Gordon from Accounts making sure you’ve got all your receipts in place. The game reaches its crescendo in the penultimate round, with the final round essentially being a perfunctory exercise in admin because all deals there are transparently knowable. 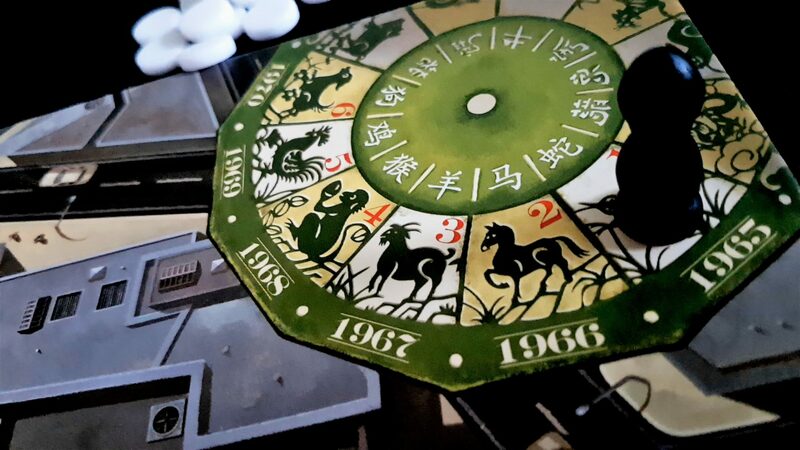 There’s a heavy dose of luck that comes into your initial draw of lots and likewise with your shop tiles. This means the first mover advantage is also paired with a ‘luckiest mover’ advantage that can be significant when the two converge. It’s ugly as sin, at least when I look at the out-of-print edition I have. It’s pretty lazy in its cultural stereotypes. I look beyond all of that. I look so far beyond it I can’t even really see it’s there unless I refocus my eyes. The rounds where Chinatown is at its best are transcendent. They are energising in a way that I don’t think you could really believe just from the premise and the description. It’s all the careful artifice and curated psychology of a used car showroom wrapped up in the deceitful transparency of an excel spreadsheet. It is absolutely marvelous and if the new printing doesn’t screw anything up I think you’d be making a huge mistake not to pick it up.